The Lodge has produced a periodic Newsletter for the members since 1998. The Lodge News will now be published as it happens, throughout the year, on this web-site. At this years Middlesex Home Service Lodge Ladies Night held in Portsmouth on the 2nd & 3rd June 2007 for W.Bro. Peter Edwards and his wife Christine the sum of £1050 was raised for Charity, of which £650 was donated to the Royal Masonic Benevolent Institute 2009 Festival appeal and £400 to the Harefield Hospital MRI Scanner Appeal . 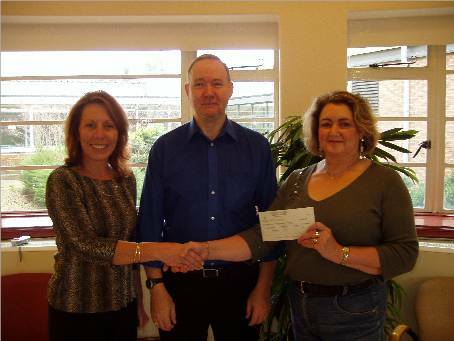 A cheque for £400 was presented on the 12th December 2007 by Peter and Christine to the Harefield Hospital Fundraising Department to help to ensure that this hospital is able to continue offering outstanding heart and lung services to those that need them in the future. 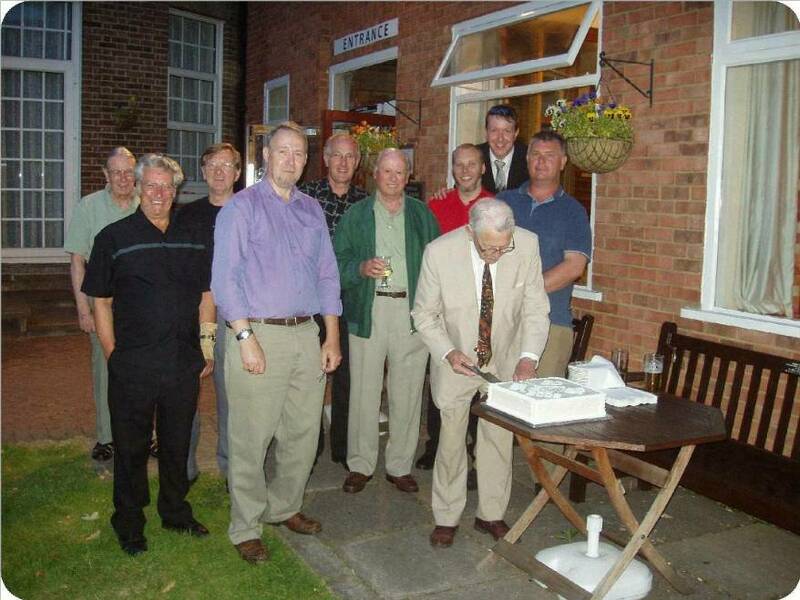 On the 9th May 2007 the Middlesex Home Service Lodge took the opportunity to celebrate the 100th birthday year of W.Bro. Peter Stroobants, P Pr JGW. 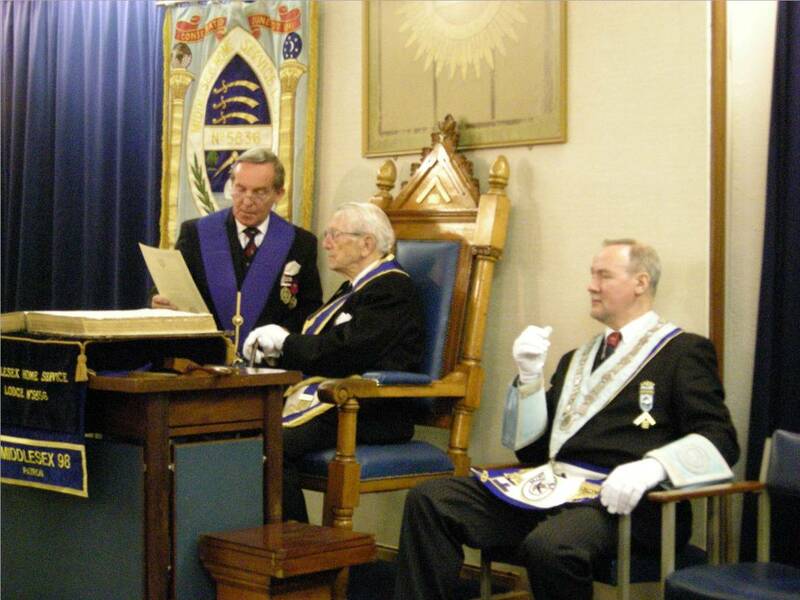 W.Bro.Peter, who celebrated his 100 birthday on the 16th April 2007, was invited by the Worshipful Master to take the Chair while W.Bro. Mike Goody, P G StdB, presented him with a 100th Birthday certificate from the Province of Middlesex. Peter has had a long and distinguished career in the Middlesex Home Service Lodge since he was Initiated on the 12th July 1955. He WM of the Lodge in both 1964 and 1966 (when England won the World Cup! ), Secretary between 1972 and 1988 and was the Lodge Chaplain from 2001 to 2005. Peter is still an active member of both the Lodge and the Class of Instruction, which he attends regularly at the Twickenham District Masonic Centre on Wednesday’s. 50 Years in the Craft! Assistant Provincial Grand Master, W.Bro. 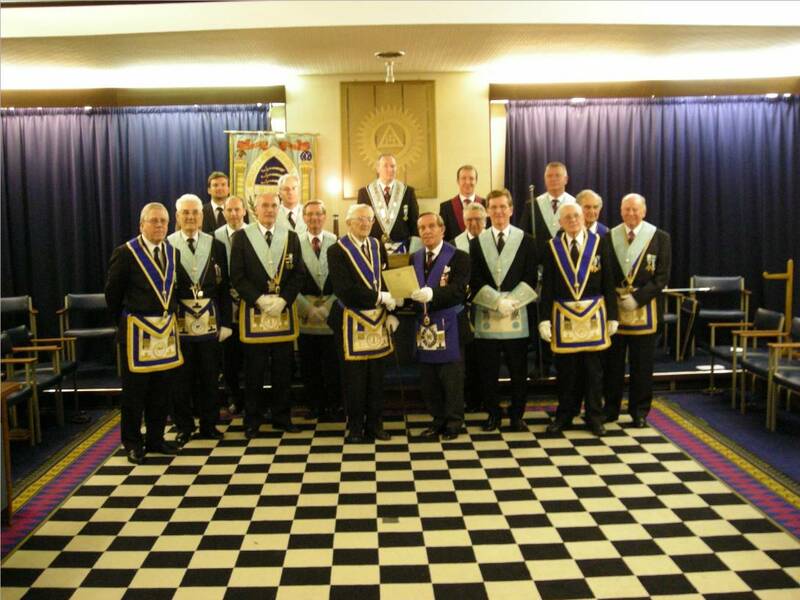 Geoffrey Rayner, PSGD honoured our Lodge by attended our meeting on the 12th October 2005 accompanied by W.Bro. A.G.D. Mason, PDGDC, W.Bro. P.T.English, PGStwd and W.Bro. J.P. Curlewis, PGStwd. Our new Worshipful Master W.Bro. Jim Mitchell and his Officers performed a demonstration of the Second Degree Ceremony of Passing. Our Worshipful Master also deliver an excellent presentation of Second Degree Tracing Board to the Candidate. 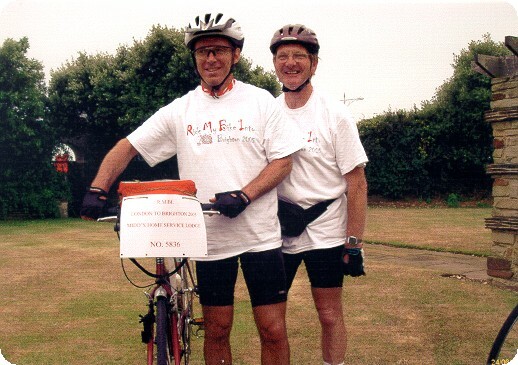 Earlier this year I read an article in the Middlesex Mercury by Paul Sully of the 'Hundred of Elthorne Lodge No7596' with reference to a London to Brighton Bike cycle ride that was being organised to raise money in 2005 for the RMBI 2009 Festival and decided to find out more about it. I discovered that the ride was to take place on the 25th June 2005 and decided to take part in the event and to represent my Lodge the 'Middlesex Home Service Lodge No5836. 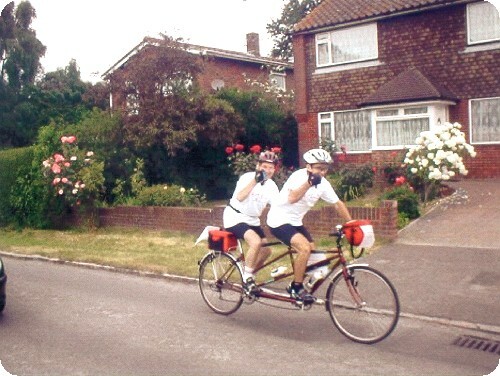 Once committed to take on the challenge I contacted my cycling pal Robert to see if he was up to riding a tandem with me. He was very keen to give it a go, so after several training rides around Richmond Park we were ready to take on this considerable challenge! We were both up at the crack of dawn, 4.30am to be precise, Robert arrived ay my home at 5.30am. 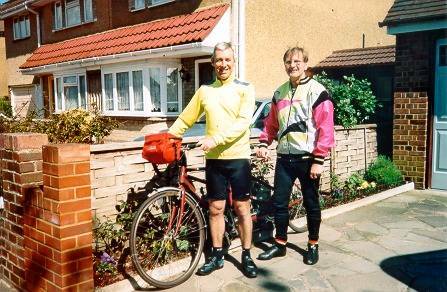 We had a last minute check of the tandem to make sure that it was in good order and safe to ride. Now the fun began! Leaving home in Hanworth, we rode to Clapham Common and the ride Start Point. On arriving there were no riders to be seen so we phoned Paul Sully to locate where they had assembled and found out that, apparently, we were on the wrong side of the Common. The other riders were very good and waited for us to arrive. A late start to the event but all was OK. A change of shirts to ones with "Ride My Bike Into Brighton 2005" printed on them, a line up of all the riders for photographs and then we were off! We cycled in a group to start with, but as the journey progressed we thinned out and all rode at our own pace. Our first stop was Turners Hill for refreshments and more photo's. Then off we went again with the presence of Motorcycle marshals and a van with fresh drinking water onboard. Finally we arrived at Brighton Pier at approximately 12.30am. After a brief halt and some well deserved congratulations we then rode to Barford Court in Hove to a great reception with ballons and a BBQ and a warm welcome from our hosts. This gave us time to rest and recover and to compare our journey down and times with all the other riders. Finally there was a presentation of certificates for all the riders that had taken part as a memento of the day, and thankfully a welcome and well deserved lift back to Staines in Middlesex by van from a fellow Mason. 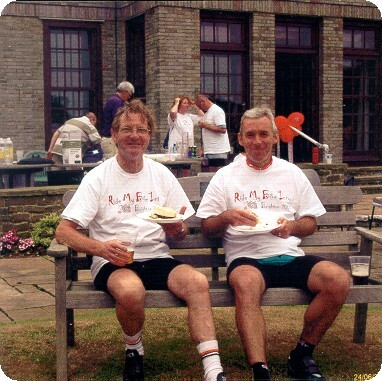 It was a most enjoyable day for us both and Rob and I are preparing for the next ride in 2006. We thank all the members of MHSL for their support of our ride and helping us to raise the grand sum of £305. The amount raised for the RMBI charity by the Ride was between £10,500 and £11,000, the final figure has yet to be announced. W.Bro. 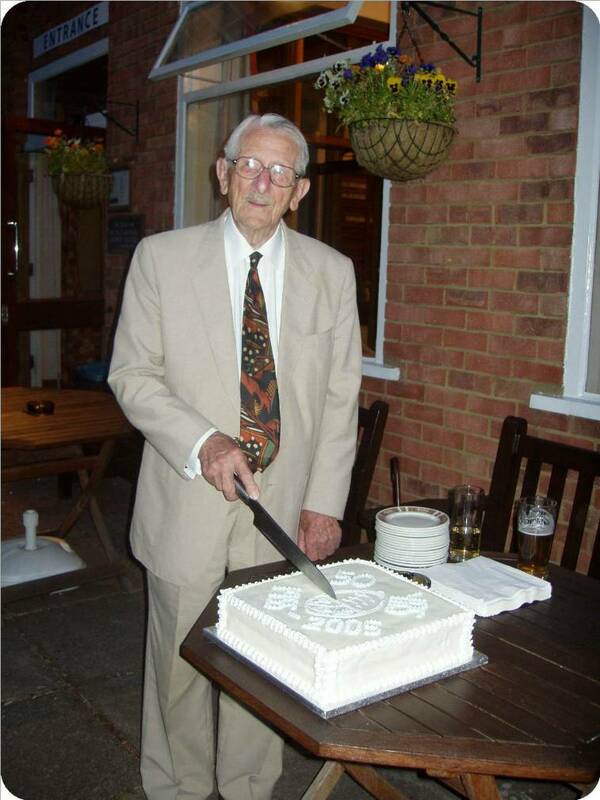 Peter Stroobants, PPGJW, celebrated his 50th Year in Masonry as a member of the Middlesex Home Service Lodge on the 12th July 2005. Peter was Initiated into the Lodge in 1955 and was WM of the Lodge in both 1964 and 1966 (when England won the World Cup! ), Secretary between 1972 and 1988 and the Lodge Chaplain between 2001 and 2005. 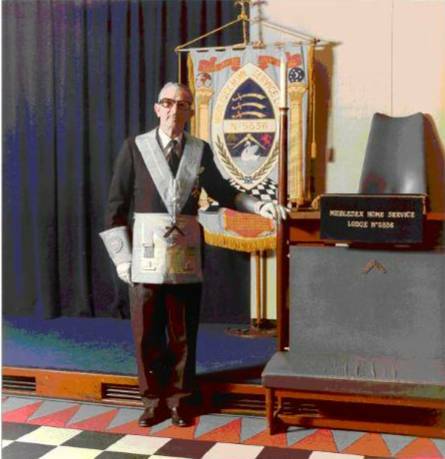 Peter is still a very active member of both the Lodge and the Class of Instruction, which he still attends regularly at the Twickenham District Msanic Centre. As a mark of respect and appreciation of all of his dedication and work within the Lodge he was presented with a 50 year certificate from Provincial Grand Lodge by our Visiting Officer W.Bro. Mike Goody,PGStdB at our meeting on the 9th June 2005. A quiet celebration was arranged by the Class of Instruction with a cake decorated with the Lodge badge on the 13th July. Long may you continue in Masonry Peter!